When a building has a strong historical and civic standing within its city, any restoration becomes incredibly complex, particularly if it has a high turnover of visitors – think the 150-year-old Melbourne Hotel, Southbank’s Arts Centre, or, zooming out of Victoria briefly: Perth’s COMO The Treasury Hotel. The refurbishment of the 140-year-old Perth heritage building was completed in 2015. Relying on cohesion between each design facet, the end result proved to be a well-executed reality, winning 5 categories of the 2015 WA Architecture Awards. 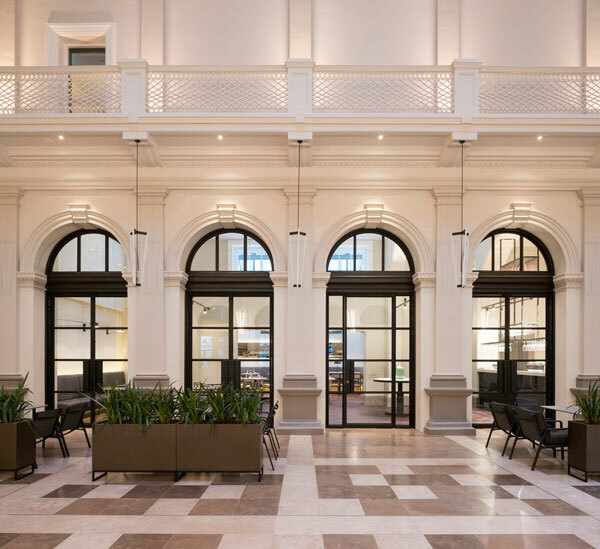 COMO The Treasury was transformed into a gentle and contemporary hotel space, synchronising its classic heritage character with beautifully integrated lighting design by NSW lighting consultancy DJCoalition. One of the categories, notably, won by the project at the WA Architecture Awards was the Mondoluce Lighting Award. On 27 March 2019, DJCoalition Director David Skelley will join over 20 high-profile local and international names within the design sector in Melbourne to contribute to an informative, distinctively Australian dialogue surrounding the role of lighting design within the built environment at the first ever Light·Space·Design 2019 summit. David’s work on the Treasury contributed to the overall “sympathetic” conversion from what used to be the Treasury Building and Lands & Title Building, to a hotel housing “a welcoming and accessible space people love to come to.” The lighting design was as a result soft and simple, aided strongly by the use of natural and subtle light. The traditional architectural planning of the building was reinforced by David’s lighting strategy, where guest rooms were softly illuminated as places of pause and rest within the building, corridors were lit as places of movement, and the ground floor was illuminated warmly to encourage social interaction. DJCoalition’s multilayered lighting strategy both reflected the depth of history engendered by the building’s many forms and highlighted The Treasury’s ability to draw people in to rest, socialise or soak up the heritage atmosphere of the building. “The ground floor [at] human scale requires a warmth to promote social interaction whilst above at Level 2, the colour varies to match time of day and daylight penetration,” Skelley says. The work DJCoalition creates within the built environment is underpinned by the idea that “light brings us together to create memories of experiences; light, like fire gives warmth and glow like people huddled around a campfire talking, laughing and sharing” – and the light streaming throughout COMO The Treasury is no different. Like David, Martin Klaasen is an old hand at lighting heritage buildings. Founder and Director of local and international-based Klaasen Lighting Design, his façade lighting work on Perth’s His Majesty’s Theatre has won him three awards: the 2018 IES WA Lighting Design Award, the 2018 IES NA Lighting Design Award of Merit (USA) and the 2018 LIT Lighting Design Award. Martin will join David Skelley as a presenter at Light·Space·Design 2019 in March. While the heritage façade of His Majesty’s Theatre was renovated a few years ago, the restoration failed to include the implementation of façade lighting. Enter Heritage Perth, who shortlisted the theatre as one of the key buildings to be lit up as part of their Light Up the City program. As with The Treasury, the lighting for His Majesty’s Theatre needed to respect its architecture while honouring its theatrical history. Klaasen says this was done right from the beginning by deciding to only use static neutral white light (3000k) to respectfully bring out the theatre’s architectural façade features, including the columns and balconies. “Colour (initially blue only, later RGB) was only brought into the semi-transparent canopy awning at street level to express the theatrical side of the venue,” Martin explains. The rest of the façade was lit in a two-fold manner to provide a subtle contrast in lighting levels “with the brightness distributions slowly increasing towards the top of the building for the balconies and window frames and fading for the columns,” he says. The building’s ornamental balconies and columns contribute strongly to the architectural signature of His Majesty’s Theatre, determining the need for dedicated and localised lighting conceptualised with careful positioning and coverage. Selecting the appropriate lighting systems for this task was a lengthy process, undertaken through many visual mock-ups. A balance between glare and comfort was achieved through appropriate beam selection, careful placing and dedicated focus to cause minimal to no discomfort for the theatre’s visitors or passers-by. Our city is full of iconic public heritage buildings, many of which have been or are set to be renovated. Though restoring these structures is evidently complex, heavily considering the role that each design facet, especially lighting, plays within the overall project can bring us a step closer to a successful and even transformative end result.